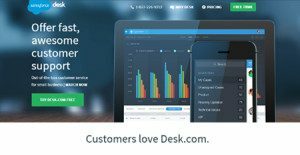 Desk.com has been one of the leading help desk software apps available on the market for the last six years. The vendor, Salesforce, however, is restructuring its platform offerings and thus it has decided to launch another program to replace Desk.com. This means that this software won’t be available anymore for new users and would be officially retired on March 20, 2020. No. 1 spot in this category is held by Freshdesk which has a score of 9.8 and has won our Best Help Desk Software Award for 2018. You can try out Freshdesk for free here. Desk (formerly Assistly) for those who are still using it has been a fast, easy way to deliver “heroic” customer service. It is geared towards SMEs, but is also powerful and comprehensive for large enterprises. Customer conversations are collated in one channel where your team can collaborate to handle, prioritize, personalize, and manage responses with efficiency to satisfy customer concerns via email, phone, chat, and social media. Add or remove part-time agents when needed and track and engage customer sentiments with fully integrated social media tools. Integration with Social Media: fifty percent of Internet users visit a social network every day, and many look for customer support there. Deskhelps you monitor the customer experience on social networks and solve problems where customers live and play. For example, you can provide social support via Facebook Private Messaging. Enjoy mobility with Android, iOS, BlackBerry Desk apps or mobile browser version. No need to switch windows and tools with the Universal Inbox access to email, Twitter, Facebook, chat, phone and discussion boards. It is as easy as using your own email, only more powerful and encompassing. Desk collects all customer interactions from all channels–phone, email, social networks, chat–that your agents can easily monitor and respond to. It allows you to skip reading each email by categorizing them with Case Filters using labels or custom fields. Tracking status and priority cases is also made easier. Create your own custom Support Center with the Desk editor, choosing your color, contact forms or even fully tweak the design with CSS and HTML to match your website. The Content Manager allows you to update and customize the Support Center for different brands without having to wait for an I.T. staff. Likewise, add built-in community discussions feature to your website. Create rules to speed up customer support, including auto assignment of tasks, set case’ status, role associations, and priority setting. Use Macros to issue standard response or perform simultaneous actions. Select all cases to change status or owner with one action. Use badges to reward performance and motivate employees. Associate customer history like past or pending issues, contact and company data in every case so your agents can personalize response. Tap Sales Cloud within Desk to view or act on customer information in real time. Desk has intuitive dashboard that delivers week over week or month over month analytics and analyze outliers. Measure at once agent performance for resolved or pending cases. Customize customer reports to focus on your priorities. Respond and impress customers in their native language with about 36 languages and variations accessible via the intelligent content management tool. Assign languages to agents based on fluency for maximum outcome. Bring Desk with you on location whenever or wherever you have Internet connectivity. Supports iPad/iPhone, Android and Blackberry devices. Mobile features include Reply by Email, Notifications, Pocket Power and Mobile Support Center. Desk is synced with Salesforce allowing sales and support teams to share the same holistic view of a customer resulting in consistent service and deliverables. Since each company has particular business wants, it is sensible for them to desist from seeking a one-size-fits-all perfect software application. Needless to say, it would be useless to try to find such a platform even among widely used software applications. The smart thing to do would be to list the various important factors that require consideration such as key features, finances, skill levels of staff members, company size etc. Then, you should do your homework thoroughly. Read some Desk.com reviews and check out each of the other solutions in your shortlist in detail. Such exhaustive homework can make sure you discard ill-fitting systems and choose the system that provides all the features you need for business success. How Much Does Desk.com Cost? We realize that when you make a decision to buy Help Desk Software it’s important not only to see how experts evaluate it in their reviews, but also to find out if the real people and companies that buy it are actually satisfied with the product. That’s why we’ve created our behavior-based Customer Satisfaction Algorithm™ that gathers customer reviews, comments and Desk.com reviews across a wide range of social media sites. The data is then presented in an easy to digest form showing how many people had positive and negative experience with Desk.com. With that information at hand you should be equipped to make an informed buying decision that you won’t regret. Effective and so easy to use. Desk.com is excellent for both types of business, either large or small. Reporting and ticketing management is good; help site could use some improvement. Influential customer service tools making the reporting easier. What are Desk.com pricing details? What integrations are available for Desk.com? Pros: I love using Desk.com since it's really easy when it comes to automation and streamlining support. If your product happens to be made in such a way where support tickets are direct and won't require numerous workflow steps, Desk functions exactly like it says on the tin. Options are limited. But it functions quickly. It lets you carry out certain basic automation for repetitive work so your reps can spendin more time troubleshooting. Cons: From time to time, simplicity would get in the way if you intend to work on something complex. Dealing with code for supports forms and other was rather confusing. Pros: Desk always provides us with the best way to interact with and respond to our customers. It provides us a very easy platform that helps in automatically assigning some particular cases to a particular category of people, so as solutions can be sought. Also, sometimes, the cases can automatically be solved. For the purpose of referencing we can also get an easy access t the entire history of the customer. The best thing is, the desk.com support team is very responsive and fun to talk to. Cons: Handling the business insights is easy but this feature is not customizable. To make the most out of the business insights, it would be better if it becomes more customizable. For instance, right now, it is not possible to send a report to a particular user via email. The time for handling the cases cannot be limited to the working hours of business which is a great problem. A few rule limitations have proven out to be greatly frustrating. The agent console is usually very slow when used with the feature of bulk open/bulk update. At times the users are locked out of the cases on which they’re working. A fantastic CRM tool and desk support.if you're aiming for the skies! Customer management made simpler by the easy-to-use Desk. The best customer support/CRM tool if you want to achieve success in your business! If you need more information about Desk.com or you simply have a question let us know what you need and we’ll forward your request directly to the vendor.